Ok, so with spring finally peaking it’s head out and summer on its way, the hottest summer party trend of the year is about to be EV-ER-Y-WHERE! What’s that trend you ask? Under the Sea Parties! Seriously! Trust me…they are a legit awesome way to splish and splash for a birthday! In a hurry to throw a DOLPHIN PARTY? 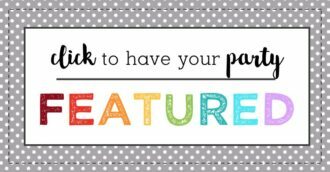 ☑️ Shop this party here and then grab the matching printables at the bottom of this page!! 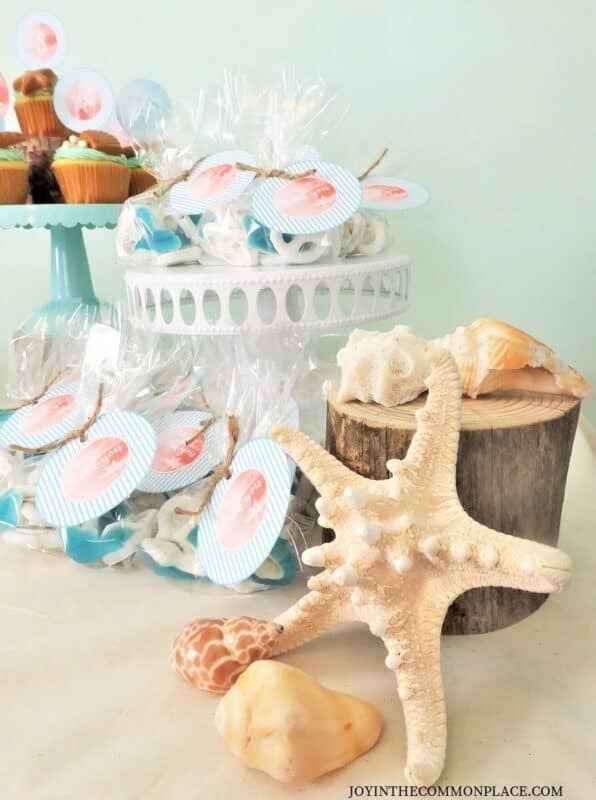 There are lots of ways to celebrate under the sea style. There is the tried and true traditional Under the Sea party theme and of course the ever popular mermaid party theme. You can also throw an under the sea party with your favorite characters, like Bubble Guppies or The Little Mermaid!! One way to really capture the wonderful ocean feel for a party is to focus on your favorite sea creature. 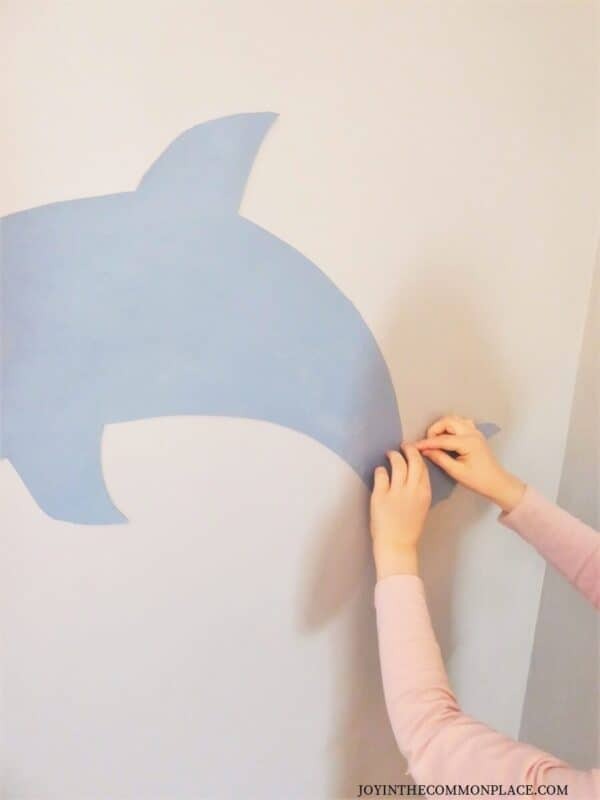 For this party, Sarina’s daughter loved dolphins…so making the party center around dolphins just made sense. 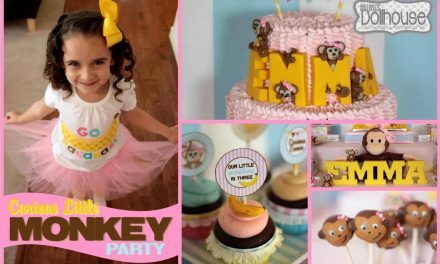 When you are planning a birthday party, it is often the best idea to choose one or two simple focuses, like dolphins, and grow your creativity from there. To accentuate the sweet dolphin silhouettes, we used aqua stripes and soft watercolor corals to create an inviting under the sea feel. 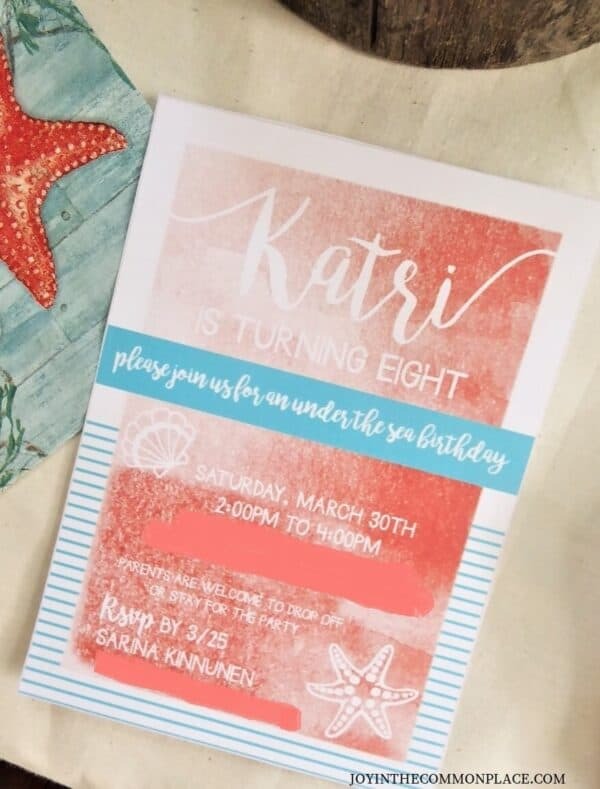 If you are interested in using these dolphin themed under the sea printables, the link to purchase them is at the bottom of this post!! You can also purchase the items used in this dolphin birthday party here. There are so many fun things you can do to throw a dolphin themed party. You can use dolphins as an accent, where the focus of the party is on the ocean or a particular color scheme and you have the dolphin silhouettes throughout. 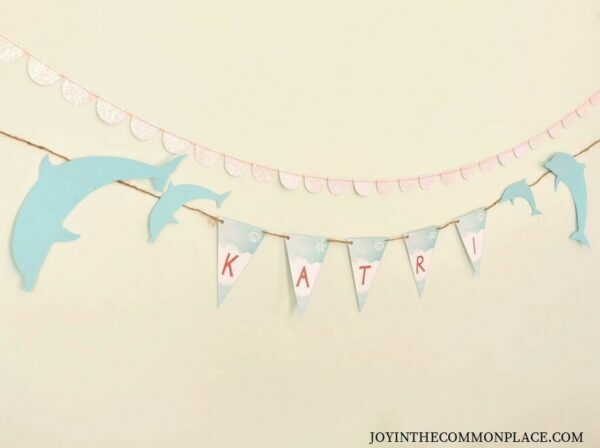 This name banner uses dolphin cutouts and is accented with this coral scallop banner. 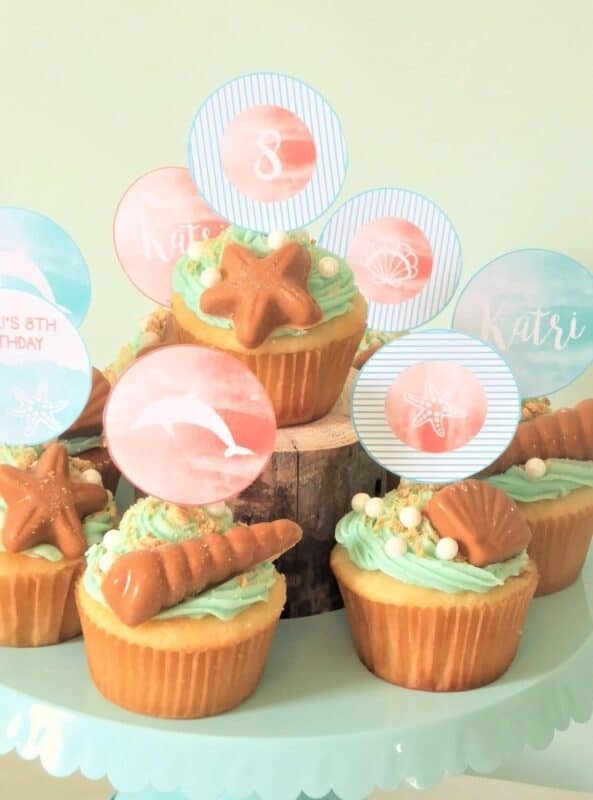 You can also take a more direct approach and use dolphin clipart or make the dolphins into dolphin cupcake toppers (like these) and have them dancing over the cupcakes! Big Family Blessings has a great dolphin birthday party that uses dolphins on cupcakes like this and its adorable!! If you want to dress your little one up like a dolphin…you can grab adorable dolphin t-shirts like this one from The Shed Outlet You can also go all out and put them in a full dolphin costume. This cute dolphin costume is my favorite!!! The center of any party, regardless of the theme, is going to be the party food you serve. 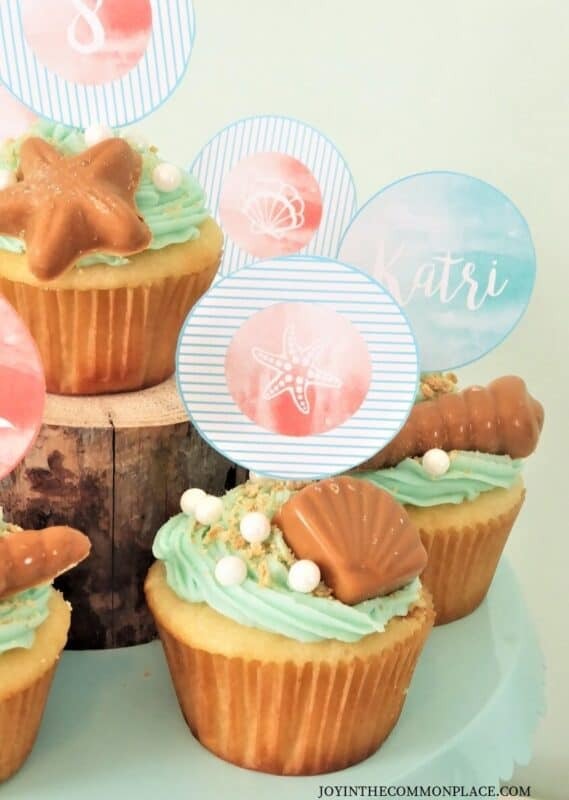 Using dolphin party food to make your party feel cohesive and provide an all over under the sea feel is sometimes as easy as themed cupcakes. These beauties are no exception. How to create them is explained more below. Setting the tone for your party is super important. This starts with the perfect dolphin invitation. THIS is one of the most important dolphin birthday party ideas to take away from this guide. You can purchase this dolphin invite at the bottom of this page. 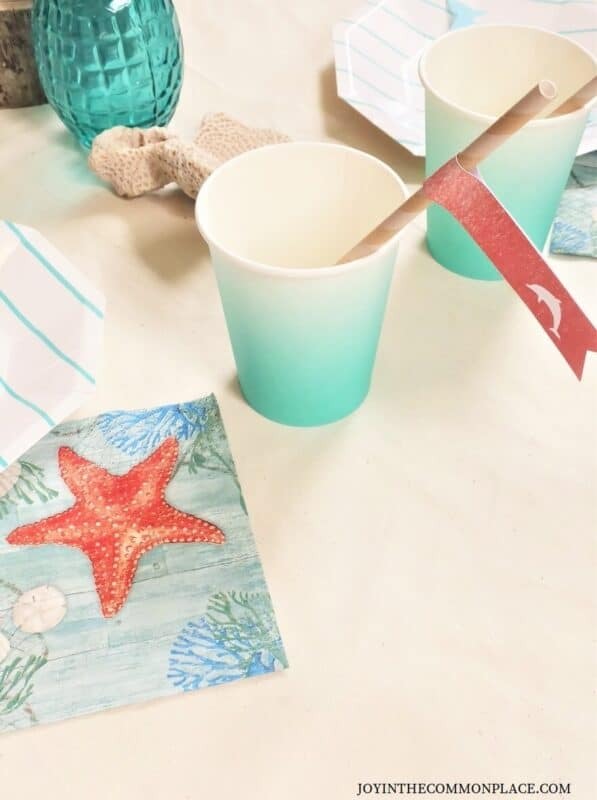 You can also get creative by writing your invite on a dolphin cutout or even putting your invitation in a bottle with some sand at the bottom so it has that island-cove, message-in-a-bottle, under-the-sea vibe. Whatever option you take…make sure you start the theme from the invitation and have fun with showing your creativity throughout the party planning. Really owning the dolphin theme is the best part of throwing a party, and this is the single thing that will really make your party stand out. Your guests will remember all the details and you will soon be known for throwing “epic themed parties”!!! Ok..you’ve been warned!! Ok…let’s talk favors. Favors can be crazy and expensive and elaborate. Buuuuttttt…they really don’t need to be. 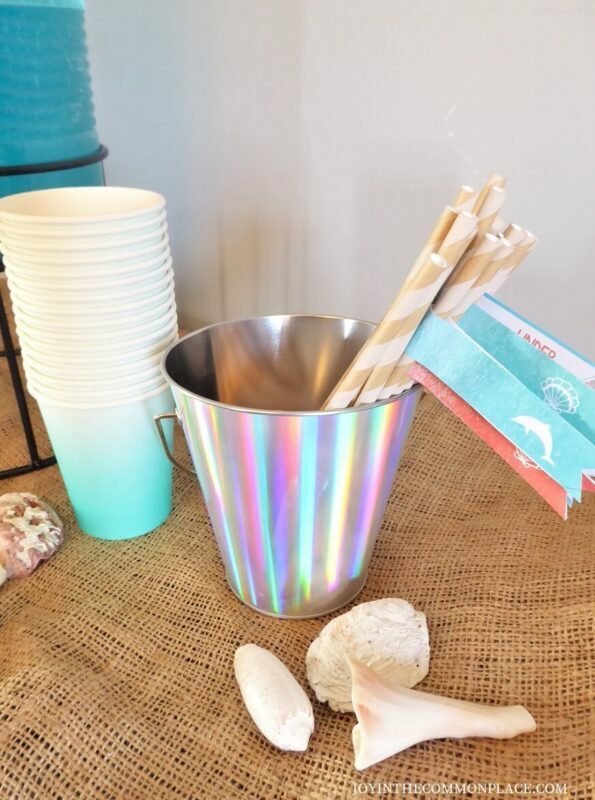 Now don’t get me wrong…there are times that putting together amazing party favors is perfection (for example…check out these awesome beach buckets I made for my daughter’s beach party…epic. ), but if you are on a budget..this is definitely a great place to scale back. Spend more on the dolphin party food or activities. Your party guests will have a great time without taking home amazing trinkets. Seriously…if you have an elaborate favor in mind and the budget to spend…own it…go for it…but if not….don’t worry about it! When choosing a favor I like to stick to two categories: edible or wearable. For this dolphin party, the favors were gummy sharks and chocolate covered pretzels. You can also grab dolphin candies to make a fun themed favor bag. Simple, yummy and on point for staying on budget! Decorations for a dolphin party can be understated or elaborate. This party really highlights some simple patterns. Aqua pinstripes, coral watercolor and simple seashells rule the day. 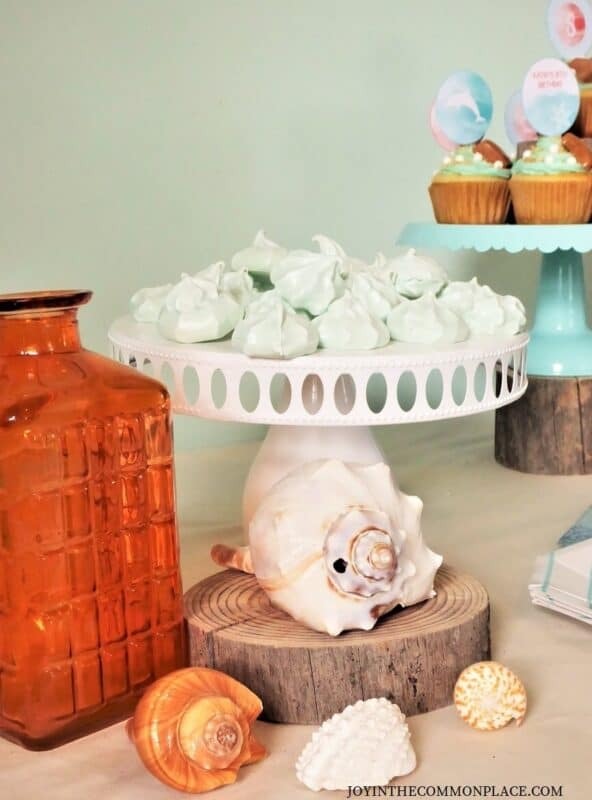 Sarina accented the tables with seashells and pieces drift wood for that natural, beach feel. 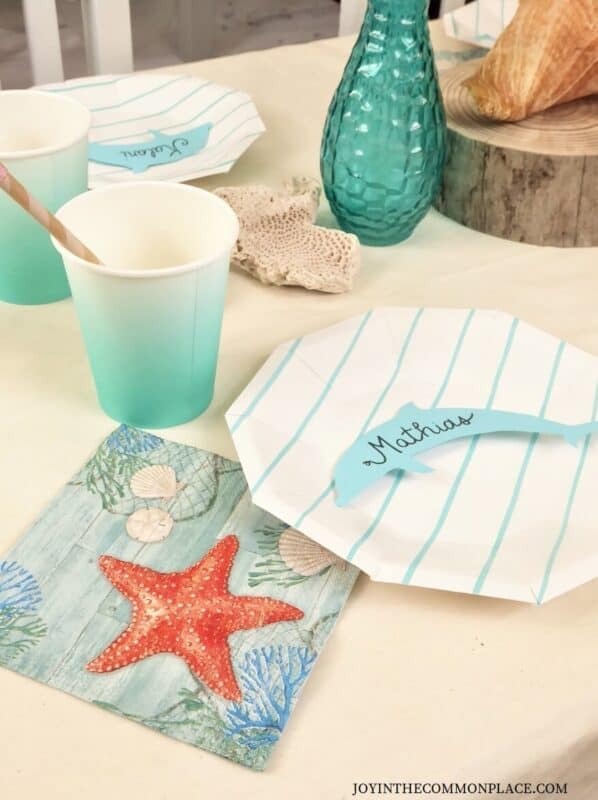 If you want to add more water and waves to your dolphin party, consider using crepe paper to make an ocean backdrop (see crepe paper backdrop tutorial) for your party table or burlap table runners to create some beach-like dimensions. You can always add in dolphin themed party supplies in various places around the party. Hanging items from the ceiling is a great way to give your party that in the ocean feeling. 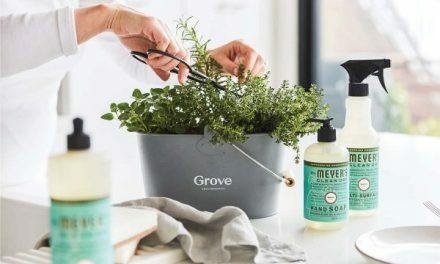 You can also incorporate your child’s favorite dolphin toys into the decor or accent with vases full of sand or fun fake plant “seaweed” (i.e. plants from a local hobby store). 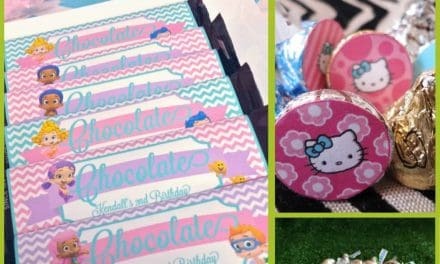 If I’m styling a party with a theme my kids are completely obsessed with…I love to pull their actual items into the party. Saves money and has sentimental value! One item that is always a hit at parties for little kids (ok and for some adults too) are paper straws. You can put flags on them or cupcake toppers or name tags. They are fun to drink out of and super cute with any cup combo!! These printable straw flags go perfectly with the tan/white striped straws. 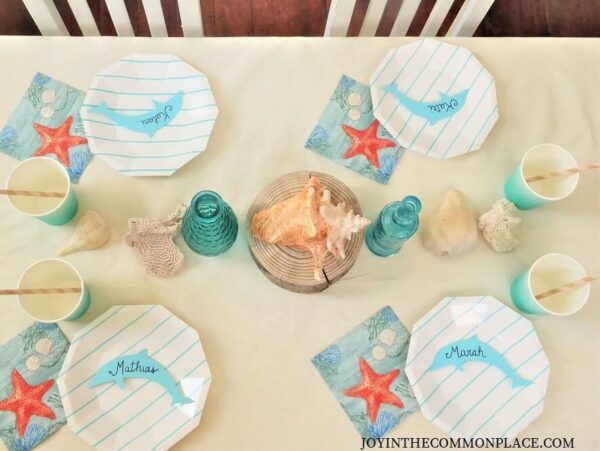 Also pictured in this tabletop are aqua striped plates, seastar napkins, and teal ombre cups. 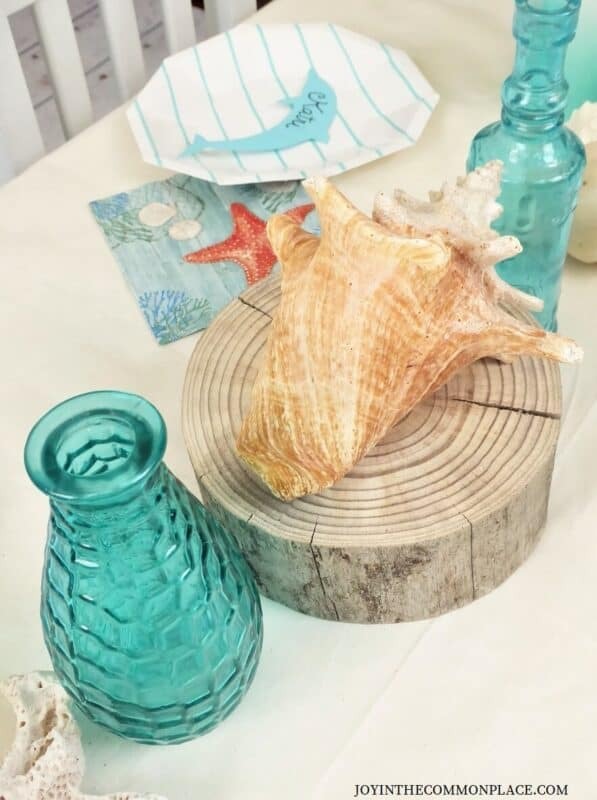 These items are gorgeous and perfect for that simple under the sea feel. 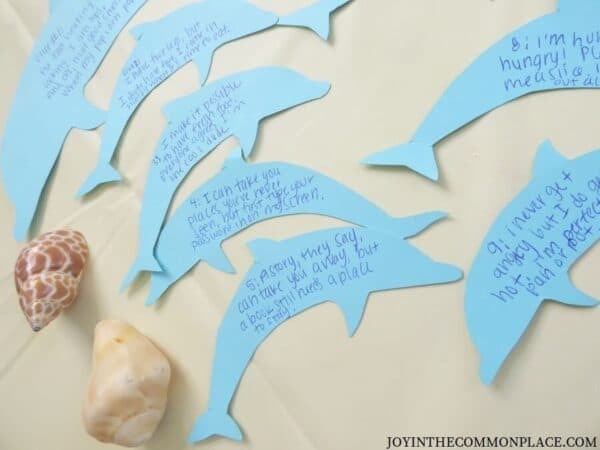 There are so many ideas for games and activities you can do at a dolphin party. Don’t get discouraged at the thought of coming up with dolphin party games. Often the simple, tried-and-true games will be exactly what you need to keep your guests occupied. With a little creativity, you can turn any ‘normal’ party activity into a dolphin party activity! If you have a pool or access to a pool, swimming is always great for water themed parties. It’s a simple activity to plan, just ensure you have proper adult supervision while the kids are in the pool. Also, throw in some dolphin pool floats to keep the activity on point with your theme! I love using the “pin the tail” concept for parties. This dolphin party game is fun and simple. All you need is a dolphin cutout (I recommend making this out of posterboard or foam board). Leave the tail fins off the dolphin and tape it to your wall. Make some tail fin cut outs and let the kids try to attache the fins while they are blindfolded. Such an easy and fun dolphin game! This simple game can have dolphin related clues or even just random things to find on dolphin cutouts. If you want to make the scavenger hunt even more fun, throw in some silly songs, noises or scenes to act out the kids have to do to complete the hunt along with items to find! Ok, seriously. Who doesn’t love a piñata? This adorable dolphin piñata from A Piñata 4U is adorable and would be perfect for a dolphin themed activity to do with your party guests. Finally, the food! You didn’t think we would go through all these ideas without hitting up dolphin themed party food, did you? Sarina made some beautiful meringue cookies using this meringue recipe. These are delicious and super simple to bake. 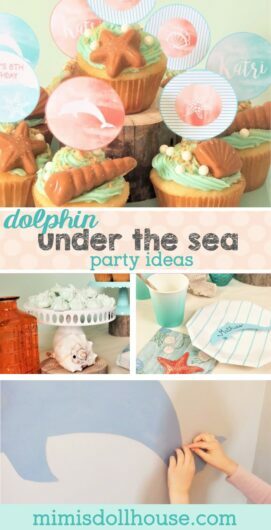 Such a fun and easy dolphin party treat! The gorgeous drink she made was a fun “sea water” themed punch. Hop over to her website to check out the recipe. Sarina used this delicious cupcake recipe to make these adorable dolphin cupcakes. She sprinkled graham cracker crumbs on the frosting and added some adorable chocolate sea shells (made using this seashell mold). Check out these ideas of ways to use graham crackers and brown sugar to make under the sea party food. 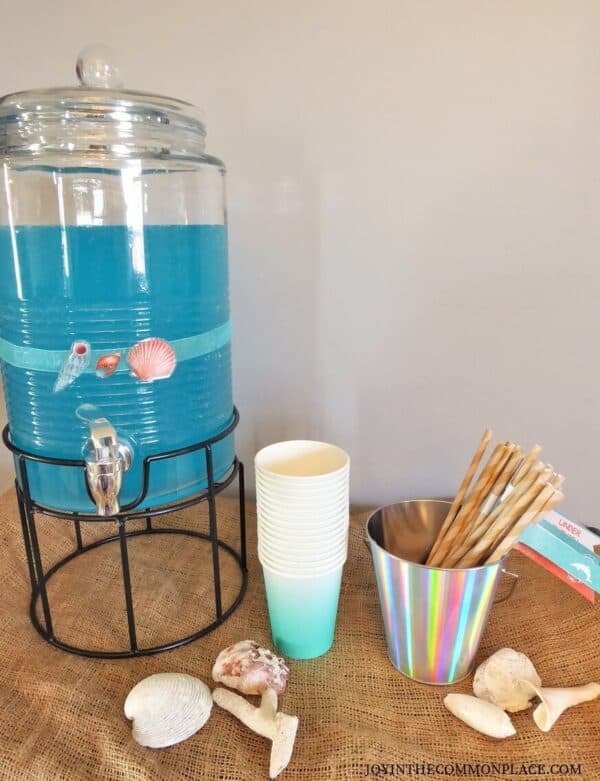 Thanks for checking out these Dolphin party Supplies and Ideas! It all turned out so cute!! Thank you…Sarina did a great job with this party!! So cute. I love all the seashells. Good integration. How stinking cute! I remember my cousin throwing a beach party when we were kids and since that day I’ve wanted to throw some kind of ocean party for my future children. Ocean parties are the best! I have used variations of under the sea a few times for my kids and they are always a hit! You are welcome. Send pictures if you throw a dolphin party!! I’d love to see it! What a cute party! I love all these tips! 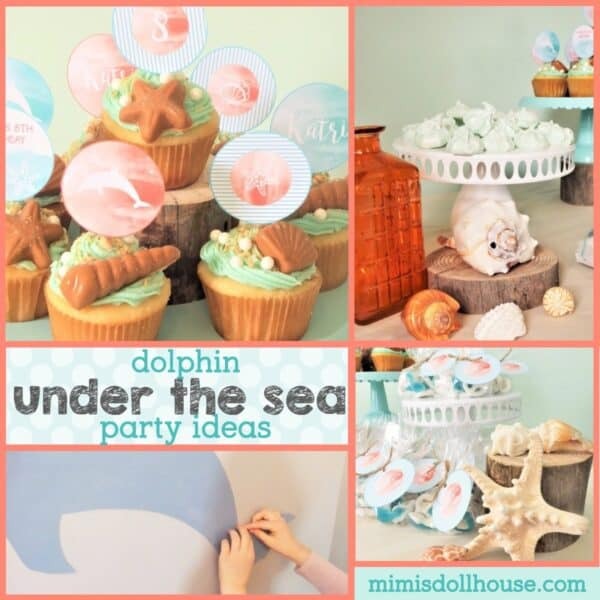 What a fantastic theme for a party – I mean, who doesn’t love dolphins?! And those cupcakes are just so cute! 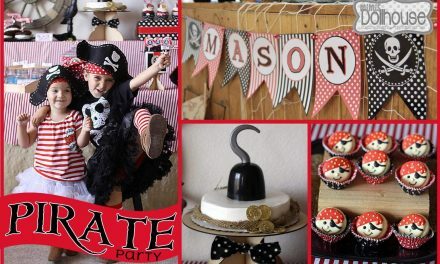 This is such a cute idea, I’ll have to keep this in mind for my daughters next party. Everything is so well put together. I don’t think my boys would ever have a dolphin party, but my oldest loves the beach so I can see a beach party in the future! He recently redecorated his room to a beach theme. These are some great ideas, I love all the shells everywhere. What a fun birthday party theme. I do not like having commercialized themes for my children’s parties, so this will be perfect for the upcoming celebration. What an adorable party! 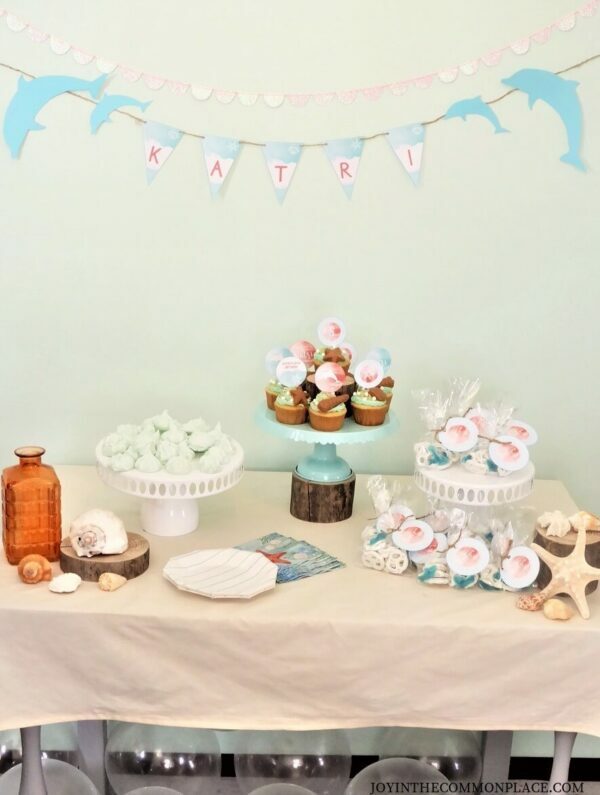 I especially love the dolphin name cards and the cupcakes! I love the theme it’s so beautiful. My neice loves dolphin we could throw dolphin theme birthday party for her. What a great theme for a party. I love the seashells on the cupcakes. This is so fun! I love all the decorations and themed food. My daughters birthday is in the winter, but I feel like this would be perfect to make everything feel a bit warmer! Everything is so cute, so detailed. And I love that blue color, it makes me feel so comfy when I see it. This would be such a great idea, so cute for any summer party! thanks for all the tips! Such great ideas! I especially love the dolphin nametags. You always have the most clever inspirations for every sort of party! Omg cutest party ever!!!! My daughter is obsessed with mermaids so she would love an underwear themed party!